Flacco completed 22 of 39 passing attempts for 192 passing yards, a touchdown and two interceptions in Sunday's 36-21 loss to Carolina. He added 14 rushing yards on two carries. Analysis: Flacco completed six of his first seven attempts en route an Alex Collins touchdown on the first drive of the day but completed just half of his attempts after that and finished with his lowest yardage total of the year. Halfway through the season, the Delaware product has completed 187 of 303 passing attempts for 2,067 yards, 11 touchdowns and four interceptions. He'll try to rebound at home Week 9 against Pittsburgh, against whom he passed for 363 yards and two scores in Week 4. Flacco completed 23 of 39 passes for 279 yards and two touchdowns during Sunday's 24-23 loss to the Saints. He added a 4-yard run during the contest. Flacco completed 25 of 37 passing attempts for 238 yards, a touchdown and an interception in Sunday's 21-0 win over the Titans. He added four yards on three rushing attempts. Analysis: Flacco found Michael Crabtree for a four-yard touchdown in the first quarter and turned over the scoring to Alex Collins after that. With an effective rushing game setting the pace, the 33-year-old would turn in his least productive performance of the season. He tallied his fewest passing yards since Week 1 but didn't make up for it with three touchdowns this time. The Delaware product will try to get rolling again Week 7 against New Orleans. Flacco completed 29 of 56 passes for 298 yards and an interception while rushing twice for 13 yards in Sunday's 12-9 overtime loss to Cleveland. Analysis: While Flacco came up only two passing yards short of reaching 300 for the third time this season, he failed to guide the offense into the end zone in 70 minutes of action. A solid option in two-quarterback leagues due to his yardage output, the veteran signal caller will look to bounce back on the road in Week 6 against the Titans. Flacco completed 28 of 42 passes for 363 yards and two touchdowns during Sunday's 26-14 victory over the Steelers. 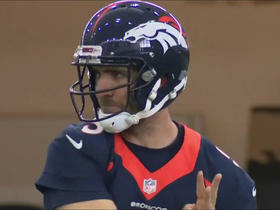 Flacco completed 25 of 40 passes for 277 yards and a touchdown during Sunday's 27-14 win over Denver. Flacco completed 32 of 55 passes for 375 yards with two touchdowns and two interceptions in the Ravens' 34-23 loss to the Bengals on Thursday. He also gained eight yards on three rushes and lost a fumble. Flacco completed 25 of 34 passes for 236 yards and three touchdowns during Sunday's 47-3 win over Buffalo. 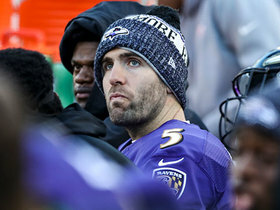 Analysis: Lamar Jackson might be the future in Baltimore, but Flacco looks like he's ready to push it off for a while. Baltimore has struggled with providing Flacco with quality receivers in recent seasons. 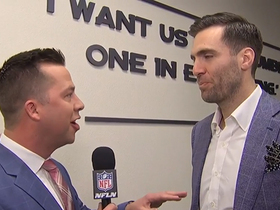 On Sunday, Flacco connected with three new targets on scores. He has some tough matchups against the Bengals and Broncos coming up, but maybe a new collection of targets is just what Flacco needed to rekindle his career. 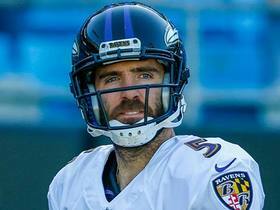 Flacco isn't in uniform for Saturday's preseason game in Miami, freelance NFL writer Jeff Zrebiec reports. 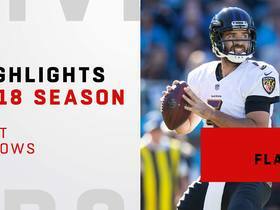 Analysis: Flacco has fared well this preseason, completing 12 of 16 passes for 143 yards and two touchdowns across four possessions. Entrenched as the starting quarterback for now, he may not be so lucky in the regular season if there are numerous bumps in the road. In particular, the Ravens traded up to select Lamar Jackson in the first round of this year's draft, a development that put the writing on the wall for the eventual end of the Flacco era in Baltimore. Flacco completed seven of nine passes for 72 yards and one touchdown during Monday's preseason win at Indianapolis. Flacco expects to play in Thursday's preseason contest against the Rams, freelance NFL writer Jeff Zrebiec reports. Analysis: Flacco isn't slated to play much throughout the preseason as the Ravens' clear-cut No. 1 QB, but he expects to be deployed for one or two drives against the Rams on Thursday. His likely limited participation in Thursday's tilt should allow for Robert Griffin, rookie Lamar Jackson and Josh Woodrum to split time leading the offense. Flacco won't play in Thursday's Hall of Fame Game against the Bears, Jeff Zrebiec of The Athletic Baltimore reports. 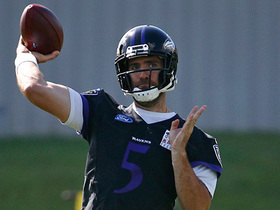 Flacco has shown improved mobility during the opening days of training camp, Jamison Hensley of ESPN.com reports. "It looks like he's moving and grooving better than he has in several years," said Ravens offensive coordinator Marty Mornhinweg. Ravens head coach John Harbaugh said first-round selection Lamar Jackson will have "a chance to develop" while learning behind Flacco. With Flacco healthy and boasting a couple new weapons, Ravens coach John Harbaugh is counting on "exponential" growth from the team's passing attack in 2018, Jamison Hensley of ESPN.com reports. Flacco completed 25 of 47 passes for 203 yards and two touchdowns and an interception in Sunday's 31-27 loss to the Bengals. Flacco completed 29 of 38 passes for 237 yards and two touchdowns during Saturday's 23-16 win over the Colts. Flacco completed 26 of 42 passes for 288 yards and a touchdown, adding four carries for three yards and another score, in Sunday's 27-10 win over the Browns. Flacco completed 20 of 35 passes for 269 yards, two touchdowns and one interception during Sunday's 39-38 loss to the Steelers. Flacco completed 22 of 36 passes for 269 yards and a pair of touchdowns during Sunday's 44-20 win over the Lions. Flacco completed 20 of 32 passes for 141 yards and rushed six times for 42 yards in Monday night's 23-16 win over the Texans. Analysis: Flacco's passing output was expectedly mild, as Baltimore's vanilla offense has seen him average just 5.35 yards per attempt this season. 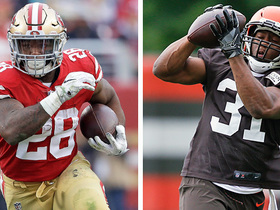 While he fell below that mark Monday and failed to throw a touchdown for the first time since Week 6, his 42 rushing yards helped compensate for that missing production. In fact, Flacco has only rushed for more yards once in 149 career regular-season outings. Next up for the quarterback is another home matchup, as the Lions visit in Week 13. Flacco completed 22 of 28 passes for 183 yards, one touchdown and one interception in Sunday's 23-0 win over the Packers. Flacco (concussion) completed 34 of 52 passes for 261 yards with two touchdowns and two interceptions in Sunday's 23-20 loss to Tennessee. 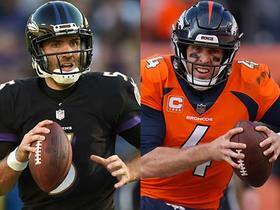 Analysis: Both of Flacco's touchdowns came during a failed fourth-quarter comeback attempt. He connected with Javorius Allen from three yards out with 8:56 to play and added a one-yard score to Mike Wallace in the final minute. Flacco's season touchdown-to-interception ratio is still an ugly 8:10. Flacco (concussion) is listed as active for Sunday's road game against the Titans. 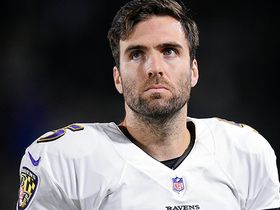 Analysis: Flacco practiced fully this week, so this outcome was expected despite the veteran QB having been deemed questionable on the Ravens' Week 9 injury report. Eight games into the 2017 season, Flacco has thrown just six touchdowns versus eight interceptions, but his prospects Sunday are boosted by the fact that both Mike Wallace (back) and Jeremy Maclin (shoulder) are available this weekend. 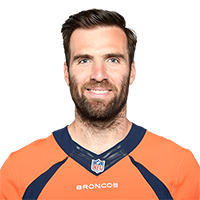 Flacco (concussion), who is listed as questionable for Sunday's game against the Titans, is slated to start the contest, Ian Rapoport of NFL Network reports. Flacco (concussion) is listed as questionable for Sunday's game against the Titans after logging full practice participation throughout the week. Analysis: Ravens coach John Harbaugh said Monday that Flacco wasn't showing any symptoms from the concussion he suffered during last Thursday's 40-0 win over Miami. The veteran quarterback's full practice participation supports the notion he's healthy, but the Ravens nonetheless opted to make Flacco one of the 12 players listed as questionable on the final injury report. Jeremy Maclin (shoulder) and Mike Wallace (back) also are listed as questionable but expected to play. Flacco (concussion) was a full participant at Wednesday's practice. Analysis: Flacco said he felt good at the end of practice, just six days after suffering a concussion in a 40-0 win over the Dolphins. He's technically still in the NFL's concussion protocol, but everything suggests he'll be cleared for Sunday's game in Tennessee. With Jeremy Maclin (shoulder) and Mike Wallace (concussion) also on track to play, Flacco should have all of his key targets available for the first time since Week 5.